Real old fashioned beef jerky is easy to make and yes, it is cold smoked. Here's how to make real beef jerky. · 2 tablespoons of ketchup. Beef jerky is a cold smoked item. This means you don't need any heat except to help dry the meat. The more air circulation the better and the less heat you need. You can use an old computer fan or any other fan to move the air. Place all ingredients in a plastic or glass bowl and stir until well combined. Add meat making sure all pieces are submerged and covered with marinade. Cover and refrigerate for at least 6 hours. Remove meat from marinade and let drain. Heat smoker to about 150 degrees F and do not use a water tray. Start SmokePistol smoking into smoker and place meat strips so that they do not touch inside the well vented smoker. Smoke meat for about 5 hours checking after about 4 hours. Meat should be dry but not hard. NOTE: Placing a fan inside smoker will help dry meat faster. 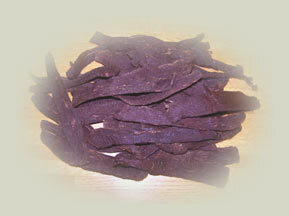 Jerky is dried not cooked so you need air circulating to dry the meat.